Is overtraining responsible for the loss to the Chinese? The simple answer is no. I am already ambivalent enough about the suggestion that there is evidence that the team was overtrained, but I am pretty convinced that it didn’t affect the outcome. There are a couple of reasons. First, one has to wonder whether the U.S. team, if overtrained, was any more overtrained than any other team — particularly the Chinese and the Romanians, who have notoriously insane training programs. So even if we were overtrained, we may still have been on a level playing field in that regard. It’s doubtful that Marta Karolyi was harder on our gymnasts than the Romanian or Chinese coaches were on theirs (not that this excuses such behavior). But there are two other factors: first, team spirit. Our team simply did not have the focus and energy that brought us victory at Worlds. Some people, like Paul Ziert, have offered this as evidence of overtraining. I don’t know what it was, but it was definitely obvious. n the end, it was not the falls or mistakes of the U.S. team members that cost them the gold. It was the superior level of difficulty that the Chinese team had over the U.S. team. With this new scoring system in place, the team with more difficulty going in has more room for error. The Chinese team had over 2 points more in difficulty than the U.S. team. This advantage is hard to overcome. Let’s start with the Olympics. First, we started off the team finals with Chellsie Memmel’s injury, and Sam Peszek’s from warm-ups just prior to the finals. Performing in Olympic order, we were up on vault first, and managed to eek out a .525 advantage. But seeing as the vault has always been one of our specialties, particularly against the Chinese, this was not as good as we could have done (especially with Shawn Johnson’s side-step that she took throughout the Games on her 2 1/2). Next up was bars. Johnson second (after Memmel), and had really only one minor form deduction for a score that is similar to that she has received in other international competitions. Nastia Liukin’s bars were almost flawless in the air, but I think she deserves to lose a lot on the terrible form in her dismount. Still, her score was high. But after this point the Chinese had a 1-point lead, meaning they had recovered 1.5 points over us on bars. The fact that two of their competitors had a 7.7 start value did not help. I think that after bars, all of the energy that we had had was sucked out of us. Even though the Chinese had a fall on beam, we matched it with Alicia Sacramone’s fall on her dismount. That was pretty much the end of this competition. Even without the fall we still would have been .7 behind if we had matched the Chinese scores otherwise. As it happens, we made up .5 on the beam, leaving us with a 1-point deficit. That means that even without Sacramone’s fall, we still would have been .2 behind. It might have given us a little bit of mojo for floor though. As we know, by the time we got to floor, especially after Sacramone’s lead-off, the Chinese just had to wait for their turn to perform what was basically a victory dance. And all three, and particularly Jiang Yuyuan (as far as getting the crowd engaged), did just that. At Worlds, we were first in all of the rotations except beam. By contrast, at the Olympics, we were first only twice, and second and third on bars and floor (the Romanians were second). Our two best apparatuses, relative to the Chinese, are probably vault and floor. At Worlds, we beat them on vault by nearly 1.6, and they finished in fifth on that apparatus. At the Olympics, they finished second, and that by only around .5. On floor, we beat them by nearly one point at Worlds. The big difference at the Olympics? We lost by 1.3 points to the Chinese — on the floor. The Chinese made huge improvements over the last year, and most importantly in consistency. We relied on this not happening. My point is: not only did we perform better (at least on some apparatuses), but the Chinese performed worse. We relied on their mistakes, not only to depress their scores, but to boost ours by giving us confidence. There is no doubt that there is a huge effect of context on athletes’ performance, and the Americans felt ready to win at Worlds. They didn’t seem as secure in that feeling at the Olympics. If anyone is to “blame” for the loss at the Olympics, it’s the U.S. team leaders for not realizing that eventually the Chinese and their A-score advantage would eventually come out on top. (A good clue would have been that they won Worlds in 2006), for the first time ever. 4 Responses to "Did overtraining lose the United States the team gold? Part II"
Nastia has a lot of form breaks on bars that the judges pretty much ignored all competition. She was overscored on every event and her floor scores were a joke. Yes over training killed the US but in the end unless China faultered they weren’t winning gold. Memmel could have really helped on floor over Alicia’s fall. No way would Alicia have been in team finals after her mess in prelims if Chellsie was healthy. Memmel would have had to hit her jam on bars and rock floor in order for the US to have absorbed how amazing China was that night. I guess it would have all come down to how Memmel and Pesek did in prelims on beam. If they hit could they have out scored Alicia in prelims and been the gymnast put in team finals? Then would they have hit? Shawn’s step on vault was a NBC media created huge deal. Fact is steps rarely matter anymore and they made no difference at this Olympics. Memmel being hurt might not have made a difference in the team competition but it helped Nastia make floor finals. Well that and judges overscoring her easy routine. All the gymnasts deserves credit but I was clearly impressed with the Chinese gymnastics team this year that for the first time, I found myself rooting for them more than I did towards the USA team. 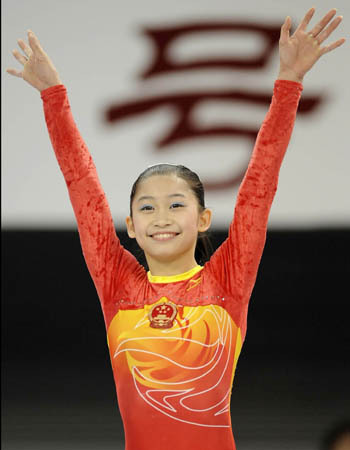 As much as I wanted Liukin and Johnson to get the gold, I didn’t mind if the Chinese won the gold either. The point is that, both the USA and the Chinese team are great gymnastics team but the Chinese had a much better day especially during the team finals. More importantly, I think the world should show better sportmanship, recognition, and respect towards the Chinese gymnastics team despite any mere (unproven) allegations. It was a bummer. I watched it in a bar with a bunch of surprisinlgy knowledgeable male non-gymnasts. We were all cheering for the Chinese to fall, but it didn’t happen. Was what we needed.